Personal happiness and independence are deeply affected by our ability to perform everyday living tasks and activities...especially within our own homes! Even for perfectly healthy individuals, our ability to successfully accomplish tasks in the home, such as cooking and bathing efficiently and safely, is sometimes seriously impeded by the way most homes have been designed and built through the years. After a spinal injury sustained in early 1953, I spent two-plus years as a wheelchair user. In 2005, I underwent spine surgery, and recently learned I will probably again use a wheelchair in the not- too-distant future. As a professional architect, product designer, and builder, I know firsthand how physical barriers in our homes prevent us from enjoying independent and safe daily living. Steps leading to the front door create a potential hazard for youngsters and adults and are a major obstacle for anyone with a mobility impairment. Narrow hallways and doorways are hard to get through when our hands are full of groceries, or carrying a young infant, or for someone using a walker or wheelchair. Round door knobs can be tricky for children’s small hands as well as the arthritic hands of adults. Trying to get something from upper-cabinet shelves can be a challenge for anyone who is short or has difficulty stretching and reaching. Lower kitchen and bath- room cabinet shelves are almost impossible to reach into. Poor lighting makes it difficult to see and hinders the performance of simple daily tasks. I began presenting free workshops on accessible and universal design (UD) applied in the home at the Southern California Abilities Expo in 2001, and at workshops and seminars at other consumer and trade events—and I have been doing so ever since. Through the years I have often been asked to recommend knowledgeable and experienced reputable architects, designers, and builders who are familiar with residential design and construction for people with disabilities. Unfortunately, they are hard to find. Recently I contacted a number of architects and designers throughout the country to inquire who had knowledge and experience in the design and construction of new homes, and the modification of existing homes, to accommodate the needs of people with physical and/or developmental disabilities. Many of them were familiar and experienced with the Americans With Disabilities Act (ADA) accessibility details, which relate to commercial environments but do not apply to single-family homes. After I reviewed a good number of home designs I received in recent years, it became clear that many architects and designers do not know how to correctly design adaptive or barrier-free living environments. I often receive discouraging accounts of contractors and builders who at the outset said they knew adaptive or accessible design and construction, but their finished work proved otherwise. In addition, I hear about poor and unprofessional workmanship, the use of inferior materials, work performed by inexperienced subcontractors, ongoing costly delays, numerous questionable extra charges and overcharges, and most of all, unhappy clients. In many cases, the architect and/or builder never consulted with an occupational therapist or other qualified professional to discuss the particular present and anticipated future adaptive challenges and needs of the individual who will live in the new or renovated home. After many years of designing and building new homes and renovating existing ones of all sizes, shapes, and prices, using traditional on-site construction technology, I wrote an article for a major magazine that included the subject of home building nightmares. I described problems caused by inexperienced and sometimes dishonest contractors, lumberyards who often supplied warped and wet lumber, inclement weather conditions delaying construction, subcontractors who often were no-shows or produced poor workmanship, job-site materials that often did not arrive on time or mysteriously disappeared, questionable high prices, and numerous change orders, etc. In all my years of professional practice, I had no experience with factory-built or “off-site” home construction, and I did not know that most of the problems and shortcomings associated with traditional “on-site” or “site-built” home- building can be eliminated with quality factory “off-site” home-building. In 2002, I became the Livable Homes Housing Pavilion consultant for AARP National Events. AARP has more than 39 million members age 50+ and will celebrate its fiftieth anniversary next year. Since 2001, AARP’s large annual three-day national member event has been in a different major city each year. This happening takes place in a huge convention center exhibit hall filled with numerous pavilions, offers seminars and top-name entertainment, and is attended by thousands of people from all parts of the country. 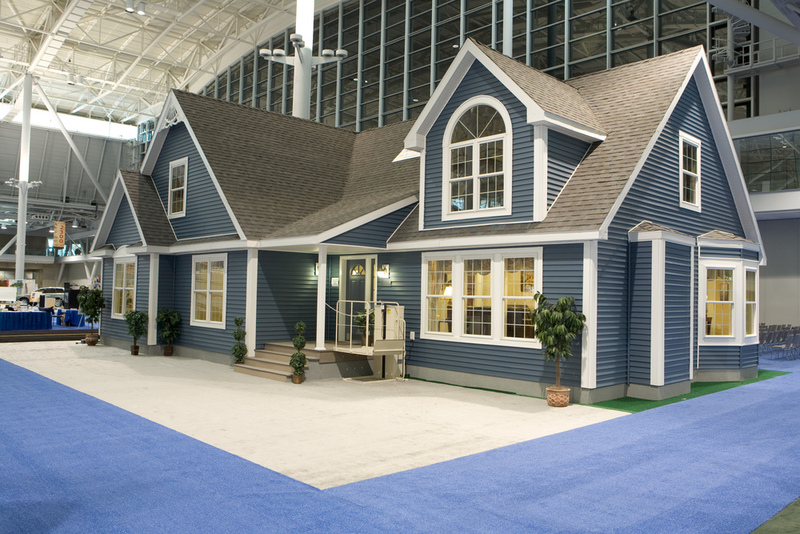 Champion Enterprises, one of the nation’s largest “off-site” or factory home-building corporations, became one of the AARP 2002 National Event exhibitors. The company wanted to develop a special show home that would meet the needs of people age 50+. I offered, at no charge, to help them design and develop an all-new, UD-featured, fully accessible home—if they would agree to build it. They did, and this home was displayed at the AARP National Event in San Diego. This gave me a firsthand opportunity to learn about homes built in a factory instead of outdoors on-site, and thus began my exciting journey into the world of “off- site” factory home-building. Two years later, I helped design another new fully accessible, energy-efficient, reasonably priced UD-featured, 1,572-square-foot, 3 bed- room/2 bath home for Champion Homes, and a new, beautiful, accessible 674-square-foot one- bedroom “backyard cottage.” These were exhibited at the AARP 2004 National Event in Las Vegas, Nev., and were toured by thousands of enthusiastic event attendees. The price for this complete home—including all interior finishes, flooring, fixtures, lighting, and appliances—came to less than $100 per square foot excluding land, site- preparation costs, and required permits. The plans for this home were subsequently given to a few quality on-site home-builders to determine the home cost using traditional construction methodology. It was almost twice the Champion Homes price. In addition, where it took less than three weeks to build the Champion home from start to finish, it would most certainly take many months or more to construct the same home onsite, exposed to inclement weather, along with numerous delays, contractor no-shows, job-site pilferage, and more. In 2006, I helped design and develop a “Generation Series” of new fully accessible UD-featured Champion homes, one of which made its debut at the AARP 2006 National Event in Anaheim, Calif., along with an Athens Park Homes beautiful one-bedroom, fully accessible Backyard Cottage. Both were highlight exhibits at the event and were toured by almost 12,500 people. Working with Manorwood Homes, a division of Commodore Corporation, I helped design and develop the new, fully accessible, UD-featured show home for the AARP 2007 National Event in Boston. On each of the three days, a continuous stream of attendees toured this elegant, reasonably priced home. I had the pleasure of taking the AARP president and a staff member of VA’s national Specially Adapted Housing (SAH) Grant program on private tours through the show home. The VA staff member affirmed the model home on display met all the SAH Program’s adaptive features requirements. These accessible homes are available with optional curb-less showers up to five square feet in size. Manorwood Homes and Champion Homes have numerous models of fully accessible, reasonably priced, energy efficient “Livable Homes” available in different parts of the country, and I am currently working toward motivating other home-builders and community developers to follow suit. I have been working in collaboration with the National Manufactured Housing Institute and National Modular Housing Council to motivate their membership of home-builders throughout the country to offer reasonably priced, fully accessible, UD-featured homes throughout America. In recent years, unfortunately, things have become progressively worse in the traditional “on- site” home-building industry as the availability of quality building materials and experienced reputable subcontractors has continued to decline. I believe factory-built home construction is really the best way to go. Modular factory-built, or off-site built, homes are just like any quality traditional site-built homes, except they are pre-built in factories, assembled in modules (sections), and then transported to the home-buyers’ site and placed on a permanent foundation. They are built to the same building codes as conventional site-built homes. Because these homes are built in factories, manufacturers are able to use sophisticated tools, jigs, and technologies that ensure all walls, floors, and ceilings are square and plumb. Major components such as these are not only nailed together, as in site-built homes, but are also bonded with special adhesives. They are engineered for trouble-free structural durability and are built stronger and with more lumber than most site-built homes because they must endure the rigors of transportation and/or being lifted and set on site, while maintaining excellent structural integrity. Manufactured and modular homes are completed in the factory in a fraction of the time it takes to build a traditional home, eliminating the possibility of on-site construction-related problems, including delays due to bad weather. Furthermore, factory-built homes are seldom subject to delays due to back-ordered materials or slip- shod work by unreliable subcontractors. Once the home is delivered, it is closed and sealed within days, and the remaining on-site work is completed within weeks. This ensures early occupancy and eliminates damage caused by poor weather and vandals. A few years ago, I began developing a new program or initiative to get a number of national off-site home- building corporations to commit to building fully accessible and reason- ably priced, energy-efficient homes to meet the needs of servicemen and -women with severe injuries and dis- abilities along with some of the more than 54 million Americans of all ages with some form of permanent dis- ability. I have worked closely with the U.S. Department of Veterans Affairs (VA) SAH Program to ensure the designs and specifications I give to national off-site home-building corporations fully comply with all criteria set forth by the program. If you have an active military service incurred severe disability and have been honorably discharged or are still in active service, you may be eligible to receive a VA new adaptive home grant up to a maximum of $50,000. Modular fully accessible homes built by any home-building corporation or company may be eligible for purchase using SAH grant funds. Each home must incorporate certain adaptive features to address veterans’ specific needs, and then reviewed by VA and approved on an individual basis. Check out www.homeloans.va.gov/SAH, and then contact one of VA’s SAH agents listed there or call 800-827-1000 for further information and advice. To those who qualify, VA also offers some direct loans and loan guarantees under the GI Bill.